any pathological or traumatic discontinuity of tissue or loss of function of a part. Lesion is a broad term, including wounds, sores, ulcers, tumors, cataracts, and any other tissue damage. They range from the skin sores associated with eczema to the changes in lung tissue that occur in tuberculosis. Kimmelstiel-Wilson lesion a microscopic spherical hyaline mass surrounded by capillaries, found in the kidney glomerulus in the nodular form of intercapillary glomerulosclerosis. 1. A wound or injury. 2. A pathologic change in the tissues. 3. One of the individual points or patches of a multifocal disease. /le·sion/ (le´zhun) any pathological or traumatic discontinuity of tissue or loss of function of a part. angiocentric immunoproliferative lesion a multisystem disease consisting of invasion and destruction of body tissues and structures by atypical lymphocytoid and plasmacytoid cells resembling a lymphoma, often progresssing to lymphoma. Armanni-Ebstein lesion vacuolization of the renal tubular epithelium in diabetes. benign lymphoepithelial lesion enlargement of the salivary glands with infiltration of the parenchyma by polyclonal B cells and T cells, atrophy of acini, and formation of lymphoepithelial islands. Blumenthal lesion a proliferative vascular lesion in the smaller arteries in diabetes. central lesion any lesion of the central nervous system. Ghon's primary lesion Ghon focus. Janeway lesion a small erythematous or hemorrhagic lesion, usually on the palms or soles, in bacterial endocarditis. primary lesion the original lesion manifesting a disease, as a chancre. Any of various pathological or traumatic changes in a bodily organ or tissue, including tumors, ulcers, sores, and wounds. To cause a lesion to form on or in. 1 a wound, injury, or pathological change in body tissue. 2 any visible local abnormality of the tissues of the skin, such as a wound, sore, rash, or boil. A lesion may be described as benign, cancerous, gross, occult, or primary. (1) Any pathological or traumatic discontinuity of tissue or loss of function of a part; a wounded or damaged area; an anatomic or functional tissue defect; an area of abnormal tissue change. (2) A nebulous, nonspecific term used by a doctor when discussing a lump or bump with a patient. 1. A wounded or damaged area; an anatomic or functional tissue defect; an area of abnormal tissue change. 2. A nebulous nonspecific term used by a physician when discussing a lump or bump with a Pt. See Mass. A useful and widely used medical term meaning any injury, wound, infection, or any structural or other form of abnormality anywhere in the body. Doctors would be at a loss without this term, but it is commonly wrongly regarded by lay people as implying some specific condition such as an adhesion. The word is derived from the Latin laesio , an attack or injury. a localized area of diseased tissue. Any visible, local abnormality of the tissues of the skin, such as a wound, sore, rash, or boil. Localized, pathological change in a tissue due to injury or disease. 2. Pathologic change in tissues. n a pathologic disturbance of a tissue, with loss of con-tinuity, enlargement, and/or function. n an area of demineralized tooth enamel that turns brown before progressing to an active caries. n also known as dental caries or tooth cavities. Typically caused by acid-producing bacteria, which lowers the pH of the oral cavity, causing demineralization. See caries. n numerous raised nodules that often appear in groups on the skin surface of the knees, elbows, and lower extremities. The nodules coalesce to form a large patch that appears to be a single lesion. n an abscess in the tooth root. Usually the result of caries, tooth fracture, or an invasive dental procedure. n an area in the jaw where normal alveolar bone has been replaced by a fibrous, mineral material. n a regularly or irregularly shaped laceration developing on the surface of the oral mucosa or normal skin. 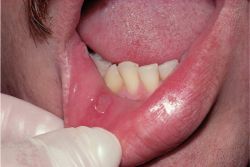 n a vesicle and/or ulceration of the mucosa caused by herpesvirus. herpetiform is used as a clinical designation unless the viral cause has actually been demonstrated. n.pl the abnormalities occurring on the surfaces of teeth that do not fall under the category of dental cavities. They may include enamel hypoplasia, attrition, erosion, abrasion, or tooth fractures. n a tissue abnormality or wound that although not yet malignant shows signs indicating the likely development of cancer in the future. n an area of softness below the tooth enamel that occurs as the result of acid retention. Can be corrected by fluoride administration. n a small, demineralized area of tooth enamel occurring under or near orthodontic brackets or bands. any pathological or traumatic discontinuity of tissue or loss of function of a part. Lesion is a broad term, including wounds, sores, ulcers, tumors, cataracts and any other tissue damage. They range from the skin sores associated with eczema to the changes in lung tissue that occur in tuberculosis. Thus, the spectrum of vascular lesions was expanded to include vascular-type AVL (Figure 11). Considerable morphologic overlap can be seen in benign and malignant vascular lesions of the breast, and individual features such as mitotic count are not diagnostically useful except to identify high-grade lesions. All vascular lesions should be considered in the differential diagnosis. It underscores the consideration that heterotopic splenoma must be included in a differential diagnosis of vascular lesions arising in the ovary. INTRODUCTION: Vascular lesions are abnormalities of vascular elements that presents at birth or during infancy. The periphery of the lesion consisted of a vascular lesion that depicted thick-walled and thin-walled vessels in close association with one another (Figure 4). Darlow et al wrote of the diagnostic importance differentiating between a vascular lesion and a highly vascular mucosa caused by an inflammatory process They recommended routine aspiration of all expansile lesions in the maxillofacial region. Gene therapy would be a more physiologic approach to deliver vasoprotective molecules to the site of vascular lesion. The highly vascular lesion was identified medial to the superior and middle turbinates, and it was indeed attached to the septum. 56] Recurrence is extremely rare and is thought to occur only when the underlying vascular lesion is not excised completely. LAS VEGAS -- Clinicians should not shy away from light-based treatment of vascular lesions in children, for reasons that include achieving better results when treated early, according to Kristen M.